From the book “The Finest Rooms in America” by author Thomas Jayne. 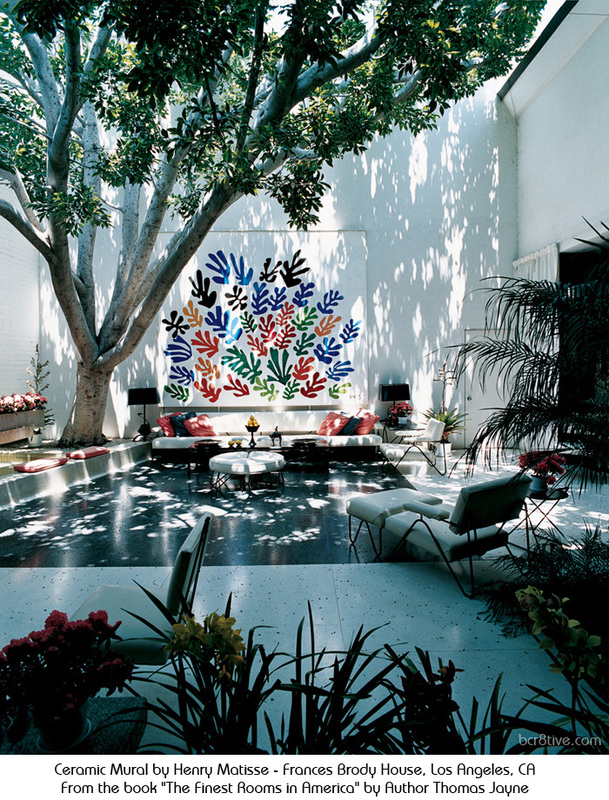 In the 1950s, the great pilanthropist and tastemaker, Frances Lasker Brody and her husband commissioned Henri Matisse to design a ceramic mural for the interior courtyard of their new house by architect A. Quincy Jones. The piece, titled La Gerbe, plays a pivotal role in shaping the space and its expression. It stands as the rooms centerpiece, its bright colors and flowing shapes popping against the solid white brick walls. Since the book has been published, Thomas put up a website where you can see some more samples from the book, contact him and also, send in your photo selections for possible inclusion in this curated collection of still more of the Finest Rooms in America. Thomas calls this “Your Finest Rooms“. This could be a great way to garner some exposure for Interior Designers and Thomas offers thoughtful commentary on the photos that make it into this collection. It also makes for a nice stop in when on the lookout for new ideas in superior Interior Design and Home Decorating. The photos are gorgeous. As for this image – this photo has it all. A creative, bright & colorful mosaic (that would most likely look great just about anywhere!) is the focal point for an equally fantastic outdoor patio design that incorporated creative and natural landscaping, that is then composed beautifully by a skilled photographer’s eye. Creative + Creative + Creative – How can I not love it?